A quality, easy to use recorder with great features. It could be a bit cheaper, though. Easy to use menu system. Remote controller. Good quality internal mic. Price is quite high. We didn't need the reverb. The R-09HR is Edirol's 'high resolution' version of its successful R-09, raising the maximum sample rate from 48kHz to 96KHz and the 2GB SD card maximum capacity to 8GB. The other changes include a larger display, a rubberised casing, a playback speaker, a desktop stand and a remote controller, which provides basic transport functions as well as track split, volume and record level controls. With a 3-4m range, the remote controller is a valuable inclusion. The internal microphone has also been improved. All of these changes and additions help to create a recorder that's more relevant to today's market, but this unit should be evaluated on its own merits. Boot-up speed is an important attribute for a device like this, as capturing audio on-the-ﬂy relies on being able to get to 'record' from cold as quickly as possible. The R-09HR takes an admirable 10 seconds to get to the point of recording - this isn't the fastest we've seen, but it's definitely fast enough. The display may not be huge, even if it has been expanded, but it's not crammed or lacking in necessary feedback. Many portable recorders come with either a limiter or AGC (Automatic Gain Control), but the R-09HR gives you a choice of both. The limiter is useful for highly transient sources (musical performances and unpredictable field recordings), while AGC really helps when recording speech and sources where sound quality is less important than audibility. An adjustable playback speed (50% to 150%) further enhances the device's usefulness for speech transcription. Unlike many comparable units the Edirol features three low-cut frequencies (100Hz, 200Hz and 400Hz), a valuable asset for reducing the mic proximity effect and 'pumping' of the AGC/limiter. If this is a desirable feature, though, then we have to say that the reverb function for playback is not. The improved internal microphone is as good as you'll find on any comparable unit. It's no Neumann, but transients are captured without sounding muffled, there's no horrid low frequency mush or hyped presence peaks, and the self-noise is admirably low. 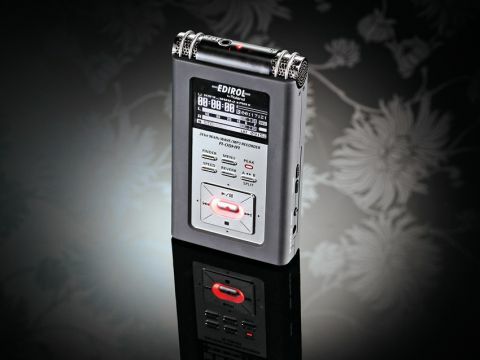 The R-09HR is a good quality portable recorder that balances ease of use with functionality and sound quality, especially now that sample rates above 48kHz are catered for. Where it shines is in the speed of operation, with only a few thumb movements enabling most of the essential parameter changes. The inclusion of a remote controller, meanwhile, really helps with the 'value added' feel of an update such as this. Apart from the reverb, which I fail to understand the necessity of, the only gripe I have with the R-09HR is the price point, which places it a good £30 above the M-Audio MicroTrack II. Overall, though, this is a fine portable recorder that deserves consideration, be it for field recording, song demos or speech capture.